Weather was the big winner around baseball on Friday, both in the big leagues and in the minor leagues. Had the Twins been scheduled to play, they likely would not have. The Red Wings were scheduled to play their first game of the season, but it was snowed out. Chattanooga was rained out. The Cedar Rapids game in Quad Cities was “colded” out. Fortunately, the weather in Ft. Myers is almost always just fine, so we still have one game to talk about. Because three games were 'weathered' out, today you will get a little more detail in your Miracle report. It was a good day for a top Twins prospect. The Red Wings will now begin their 2018 season on Saturday afternoon with Aaron Slegers on the mound. The teams will make up the game later in the season. The Red Wings did announce that LHP Casey Crosby and Catcher Jordan Pacheco will begin the season on the disabled list. The Lookouts were unable to play the second game of their season because of rain and wet field conditions. The teams will play on Saturday and then two games on Sunday to make up for the game. The Florida State League can be a difficult league for offenses, and it certainly will play out that way. But on this night, the Miracle were able to score six runs and scored in five different innings. In the second inning, after singles from Lewin Diaz and Travis Blankenhorn, Nelson Molina singled in the Miracle’s first run of the game. And then they showed a little power. In the third inning, Aaron Whitefield knocked his first home run of the season. 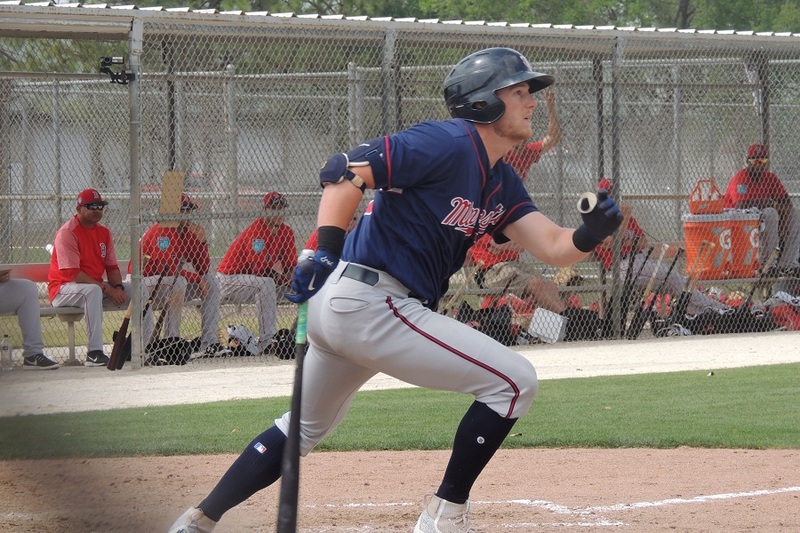 In the fourth inning, Travis Blankenhorn gave the Miracle a 3-1 lead in the fourth inning with his first homer of the year. Tyler Wells made the start for the Miracle. He gave up a run in the first inning, but that was the lone run he allowed through the first four innings. He gave up three hits, walked two and struck out three. Logan Lombana came on for the fifth inning. He got two outs, but he gave up three hits. He left the game with two runners on and a one-run lead. Lefty Andrew Vasquez came on and after loading the bases with a walk, he gave up a two-run, game-tying single before getting the third out. Vasquez did work a perfect sixth inning. In the bottom of the sixth frame, the Miracle were able to tie the game at 4-4. Travis Blankenhorn hit his second double of the season and scored on a Jared Foster fielder’s choice. The game remained tied as Colton Davis worked two scoreless innings despite walking four batters. In the bottom of the eighth, the Miracle regained the lead. Caleb Hamilton led off with a walk. Jaylin Davis hit a one-out double that scored Hamilton and give the team a 5-4 lead. Davis went to third base on the throw and then scored on a wild pitch to make the score 6-4 heading into the ninth inning. Hard-throwing Alex Robinson came on for the ninth inning to protect the two-run lead. After getting the first out, Robinson hit a batter, gave up a single and a walk to load the bases. He got a strikeout for the second out. He then got a fly out for the final out of the game and his first save. The Miracle improved to 2-0 on the season. Miracle pitching coach Henry Bonilla was ejected in the eighth inning. The Kernels went to Quad Cities on Thursday night for their season opener. They didn’t make the trek on Friday because of the cold weather conditions. On Saturday, the River Bandits will travel north to help the Kernels open their home schedule. New Miracle play-by-play guy, Marshall Kelner made some very nice comments about another prospect Aaron Whitefield. Whitefield has REALLY been impressive. Seems like all the pitchers were getting their feet wet. Didn’t seem like there was many games in ST for them to get their innings in. Wells didn’t strike out everyone like usual, but one thing that sticks out to me is they can’t square up on him. Almost no hard hits. Just some seeing eye grounders and bloops. And TONS of foul balls. 1er in 4ip in the season debut at a new level is JUSSST fine. Minor league spring training was just as long this year as normal years, but they'll be protective of their young arms, for sure. I heard that pitchers pitched about half as many innings as last year during ST? Weather is ALWAYS unpredictable year to year, and pays not attention to the baseball season. Still, I have to wonder if baseball should consider more scheduled double headers with a week or so later starting time to combat mother nature. (Perhaps with an enlarged roster or greater roster flexibility). 1] Can Blenkenhorn ever find a position? I'm speculating from his movement that he just CAN'T play 3B. Is it really so early in his career to give up on him there? 2] Whitefield may be one of the most intriguing prospects in the entire system. Foreign country, late to baseball, and from all reports you read...actually a lot like Kepler...a tremendous and natural athlete. I have a hunch this kid is going to just explode one of these days...maybe this season...and be a 5 tool potential in the top 15 for a deep system. Blankenhorn looked pretty decent at 2B.I'd see him as a Denny Hocking type player who could play anywhere, but is just a purebred athlete. That could be a stretch for Whitefield, but you know what?There's nothing saying this kid couldn't be.Insanely fast, great glove, quick bat (from the days of playing softball), and great size.After starting very strong, he faded a bit in his first full pro season.I'd love to see an Australian ball player really make it one of these times. Daily stat lines from top 20 prospects.GENIUS!!! Whitefield is a nice athletic prospect with good speed who will need to cut down on strike outs. But comparing his defense to Buxton's? I look forward to see how good Tyler Wells does this year. If he’s healthy I think he’s going to surprise a lot of people this year. I think it’s unrealistic to believe he’ll make it to Rochester, but like Berrios in 2014 I think Wells could easily be promoted to AA by the All Star break and be knocking on the door to Rochester by season’s end. The Miracle are on the road today. I think the Twins and Blankenhorn are more than OK with him playing and developing at 2B and 3B. He split his time this spring. Position flexibility is an important thing for young players and prospects. He'll likely never be a Gold Glove caliber defender at either place, but he can be adequate enough that if his bat develops, he can play where there is a need. Whitefield is as good of an athlete as Kepler (or anyone). He was just as raw as Kepler when he came in, and there are a lot of similarities between the two of them. Whitefield's a little bit faster. Similar power. Whitefield's probably a little better defensively. Both have strong arms. Whitefield just didn't sign with the fanfare. Still working his way back from the knee surgery. He was taking ground balls when I was there. I see now that he's starting to get some live at bats in spring training. He could get to Chattanooga this year. He lost 25-30 pounds over the offseason and has worked very hard. He's got a good FB, CB and SL. He is quite talented, but he also needs innings and time.